I firmly believe that once you know the rules, you can break them. Subverting expectations, playing around with tropes, or simply trying something out of the norm can yield to some fantastic art. I’m keen on trying things like ignoring the rule of thirds or experimenting with selective focus, but there are some rules I sometimes try not to break: The ‘facts’ that have been previously established for a particular character or property. Darth Vader is Luke Skywalker’s father (spoiler alert!). Batman is Bruce Wayne, orphan-turned-vigilante of Gotham City. Benny loves Spaceships! These are examples of ‘truths’ that govern the mythologies surrounding popular characters. These are rules that, in my mind, cannot easily be broken, because they are inherently important to the subject matter. I started thinking about this after recording and upcoming podcast with my pal Eric, aka @Intangibledandy. 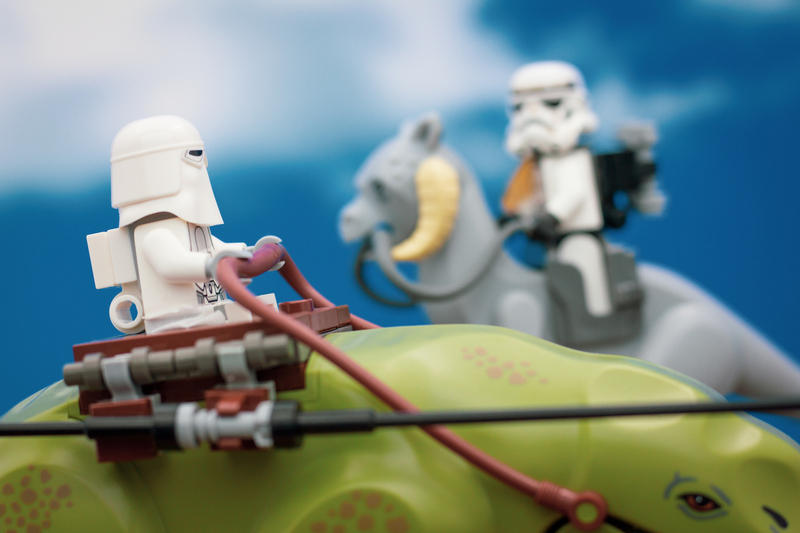 Like me, Eric likes to use iconic characters and properties in his photos. Currently he’s blending He-Man characters with Thundercats, and creating some amazing new stories with characters I thought I knew. He sees the pre-established rules of both of those universes, yet breaks them for the sake of storytelling. For my images, I strive to be able to tell a complete story in a single frame. Part of the way I try to accomplish this is by knowing which ‘rules’ and story guidelines to follow, subvert, or intentionally break into a bunch of tiny pieces. Take Star Wars, for example. I love photographing Stormtroopers, which are characters that actually have several ‘rules’ thrust upon them by the films, comics, and TV shows. For instance: They couldn’t land a blaster shot the broad side of a barn, they die very easily, and they have armor that changes depending on which planet, climate, or even timeline they’re in. Because of this, I would not place a Snowtrooper on Tatooine. Unless, of course, the Snowtrooper was there for a specific story purpose. This is something that’s come up several times already on the podcast, as Kristina and I have both used Stormtroopers as “every men” in our photos. Check out Still Life and Action as examples. Knowing the governing rules over certain characters can help you tell better stories. If it weren’t for the shared knowledge that Vader is Luke’s dad, we wouldn’t get countless playful interpretations like Jeffrey Brown’s Vader and Son. Understanding the rules and abiding by the most important ones can help give you a framework in which to craft your story. In a sense, we’re then creating fan fiction that exists within the parameters of the existing story, in between the lines. 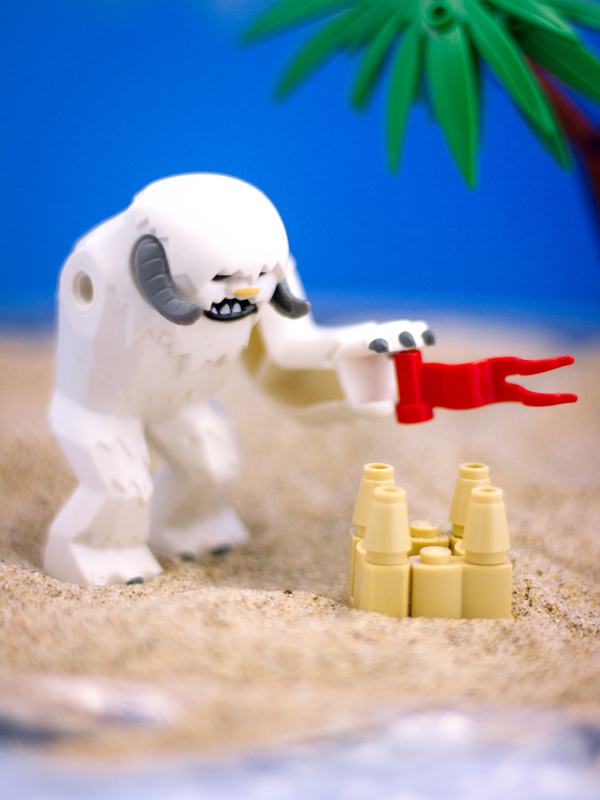 After what happened on Hoth, the Wampa desperately needed a vacation. In this image, I’m taking the Wampa’s history – in which he has an encounter with Luke on Hoth in The Empire Strikes Back – and telling a story that comes sometime after. I’ve removed the arm to establish the timeline, suggesting that perhaps the Wampa lived, and took a much-needed vacation. At the end of the day, my thoughts on this come down to intention. If I’m in control of my narrative and making conscious decisions to achieve my artistic goal, I think I’m taking better photographs. At the very least, I’m weaving fan fiction tales by abiding by some rules, and breaking others. What do you think? Do you try to follow character or property-specific rules in your photos? How do you subvert or break them? I’d love to hear your thoughts in the comments below! If you’ve made it this far, come continue the discussion over at our G+ community! While you’re at it, subscribe to our weekly email round up so that you never miss a post, and subscribe to our podcast! Subverting expectations is the guiding principle for most of my photos! I highly recommend it for creating silly images. I totally get what you are saying here! Thanks Sunny! I love that aspect of your photos. Subverting expectations is something I always turn to first when going for comedy. It depends entirely on what I am doing, and what the subject of the photo is. If I set out to create a Star Wars scene, then I’ll be as realistic as possible to the characters in the story. However if I am taking a photo of, say, a day at the beach, with a character from Star Wars then I’m not going to be so slave-ish to the character. I think it goes to plausibility of the characters actions. It is quite plausible that, say, Boba Fett would go surfing on his days off. However it is much less plausible that a Tusken Raider would go surfing on his day off – therefore if I am going to use a Star Wars character surfing, I’m more likely to reach for Boba than a Tusken. 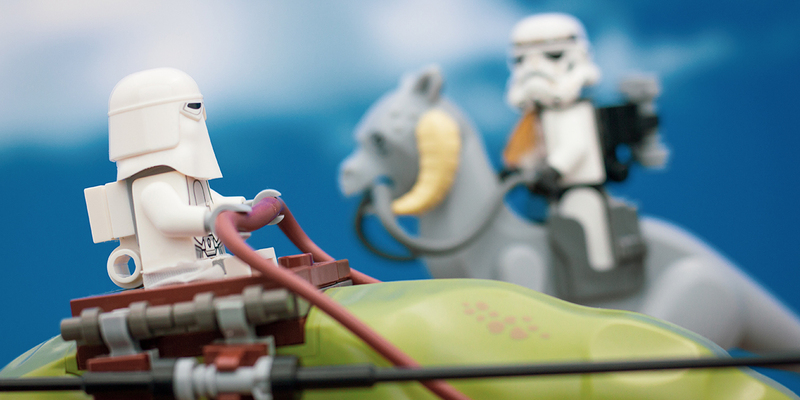 This is one reason why storm troopers are so popular. Their life when not on-duty has been largely unexplored, and they have been shown in almost every environment imaginable, so it is quite plausible they could get up to anything during their time off. Add to the fact that, aside from Finn, none of the non-clone troopers are even shown without their helmets, the plausible possibilities are endless. However none of these are rules – just guidelines, and personal guidelines at that. YES. Thank you Dave, I couldn’t have said it better myself. I had never quite considered the plausibility angle before, but you’re 100% right. Perhaps I’ve been doing that subconsciously. I think pushing that boundary between plausibility and silliness can be a lot of fun. Love the post James! I like to break rules too. And mostly I don’t care for continuity of myth. But, just like Dave said, it depends on the story I want to tell. And just like Sunny said, breaking these decorum rules is funny. I use it mostly for puns. Thanks, Tomasz! I agree with you and Dave, it all depends on the story. I like doing both. I like to mix things up, but sometimes I want a photo that fits the universe of the characters. I like the different take on “breaking the rules” in this article James. I do agree with a number of points already raised especially with Stormtroopers being such versatile subjects. I liken it mildly to Antman where he pretty much fits into most situations in real life. Personally, I tend to not stray too much from the character’s main personality. However, I try to show a positive side to characters often portrayed in a certain way. I recently got myself a Deadpool figure and have been thinking about how to shoot him (not literal of course. Lol.) “Violent” and “crass” are probably 2 words we often associate with him but how about exploring the aspects of dealing with loss, redemption and being somewhat inspiring which are parts of his story? Food for thought! Thanks, Janan! You’re right about Ant-Man, he’s such a fun figure to photograph because his nature makes him highly versatile. I certainly need to take more shots with him. I love your Deadpool idea; I for one think it would be refreshing to see that side of the character! I agree with James, Janan! Would love to see the redemptive side of Deadpool more often. Great thoughts, James. It’s useful to ponder why certain images work, and the subtleties of storytelling in a single frame. Really appreciate an article that slows down and shines the light on that particular technique of subverting the existing rules or tropes. I think a lot of folks do it by instinct, but talking about it here is giving me more ideas about how to approach it even more intentionally. I enjoy creating all of these: scenes that re-enact already established stories, scenes that fill in blanks in the story or timeline in plausible ways true to the characters, scenes that indulge in pure flights of fantasy fan fiction, and scenes that deliberately go for silliness or to provoke a reaction with the utter absurdity of them. And what’s so brilliant about this medium is that we can do it ALL.